Astronaut John Glenn is a hero. With the passing of Astronaut Scott Carpenter last October, Mr. Glenn is the last of the Original Mercury 7. Every February 20th, I take a moment to reflect on what Glenn, his mission and his place in history means to me. 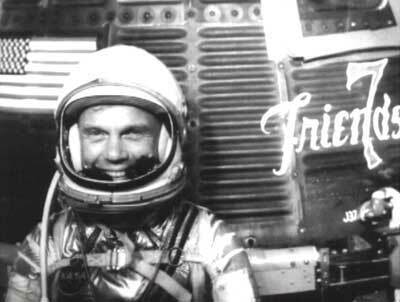 This is a post I made on the 50th Anniversary of Astronaut John Glenn’s Mercury mission. I thought I’d re-post if for the 51st. And the 52nd. Today marks the 50th 52nd anniversary of John Glenn’s Mercury mission…America’s first manned orbital space flight. There should be no question in anyone’s mind that John Glenn is a hero. the word ‘hero’ gets tossed around an awful lot…in some ways I think it’s meaning has been diluted…but that’s another talk for another post. Which leads me into being stupid. I had an autographed picture of John Glenn. I got it when i was 11 years old. Mr. Glenn was a US Senator then. I just wrote him a letter and a few weeks later there was a return note and glossy black and white 8×10 of him in front of his Mercury spacecraft. At the bottom there were the words “Best Regards, John Glenn” in brand new sharpie scrawl across the bottom. that pic meant the world to me…I was so excited that i went out and used my allowance to buy a picture frame for it. It was real, it was from John Glenn and it was for me. 1. I do not remember what I needed the money for. 2. I do not remember how much the picture sold for. 3. I do not understand why I would sell something that meant so much to me and was a part of the waning years of my childhood. I sold a piece of history, my history, at an electronic garage sale. Whatever I got for it couldn’t possibly be worth what I lost in mailing that image out of my life. I didn’t realize that at the time… obviously I do now. I guess I can be thankful that I had something like that for a while anyway. So if you have a few spare seconds today, think about Mr. Glenn and what he did 50 years ago. He willingly strapped himself into a tin can on top of a re-purposed intercontinental ballistic missile and was shot into space. Would you have the guts to sit on top of a controlled explosion built by the lowest bidder? Would you have the guts to ride in that tin can as it looped around the planet three times? Knowing that the only thing between you and almost instantaneous death was a few inches of steel and insulation? What he did was new. Almost everything about what he did was unknown… but he did it. Just like I did it when I sold that photo. The difference is I doubt Mr. Glenn has any regrets.